There is a group of small islands in inner Kongsfjorden known as Lovénøyane, but they are known to few only. In summer, when most people are visiting Kongsfjorden who get there at all, it is not allowed to go ashore or even get within 300 m from the shore. The Lovénøyane are then home to breeding geese and eider ducks and they are protected as a bird sanctuary. Only some scientists from Ny-Ålesund visit the Lovénøyane on a regular basis to do research work on the bird populations. The birds are getting fewer and fewer, as the islands are now annually visited by polar bears who are scavenging on the nests. The tundra breeders are easy prey for predators that can reach the islands. It is an open question if polar bears have learnt a new behaviour, if it is an adaptation to feed on birds’ nests on tundra islands rather than seals on ice of if the Barents Sea population of polar bears, which has been growing since protection in 1973 (it had been severely hunted until then) is moving back into its periphery now, as more individuals are crowding the core areas. 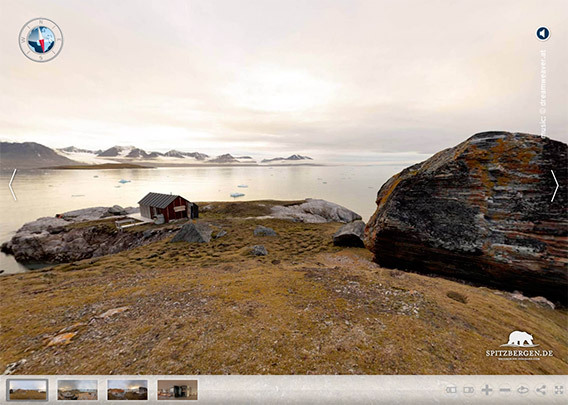 Spitsbergen’s west coast is the periphery, seen from most polar bears’ perspective. It is only possible to speculate, we don’t know this. Maybe a bit of everything. As we can only visit Lovénøyane after 15th August every year, we will have autumn light. With a bit of luck, we have beautiful light of the low sun for hours above the famous mountains and glaciers surrounding Kongsfjord. The tundra has been fertilized through thousands of years by breeding birds and one has to move around carefully in order not to damage the vegetation. Especially mosses have built up thick layers of organic matter. The Lovénøyane comprise several small islands which have all their individual characteristics. Geologically, they are partly made up of old basement rocks (fine-crystalline carbonates or „marble“) and partly beautifully reddish Old Red sandstone. 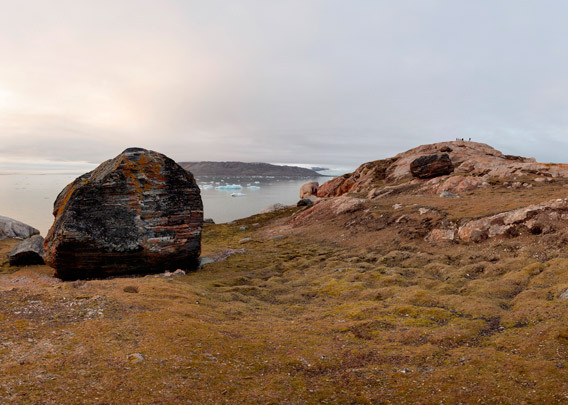 Pleistocene glaciers have left large erratic boulders on the islands. 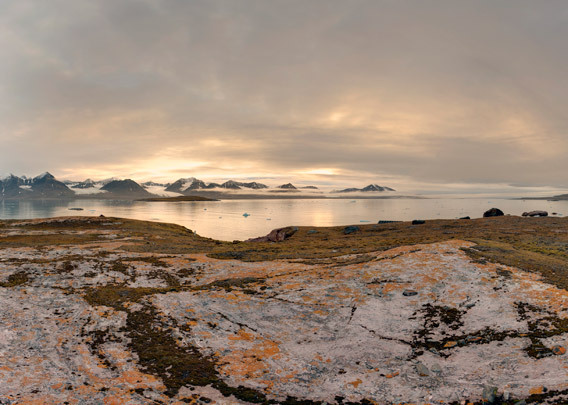 Juttaholmen, as this island is called, was named after the housekeeper of Gunnar Isachsen, who was the leader of the expedition that mapped and named the island 1909 or 1910. That is how it worked back then. Times have changed. It is said that Ernest Mansfield’s famous Northern Exploration Company (NEC), who had the marbly quarry “Marble Island”, now rather known as (Ny) London or Camp Mansfield on Blomstrandhalvøya, mined some breccia on Juttaholmen. A breccia is a sediment which is not of high economic value and it is hard to imagine the purpose of mining it on the small and logistically very demanding island of Juttaholmen. They can not have mined large quantities, rather a few tons if anything really at all. 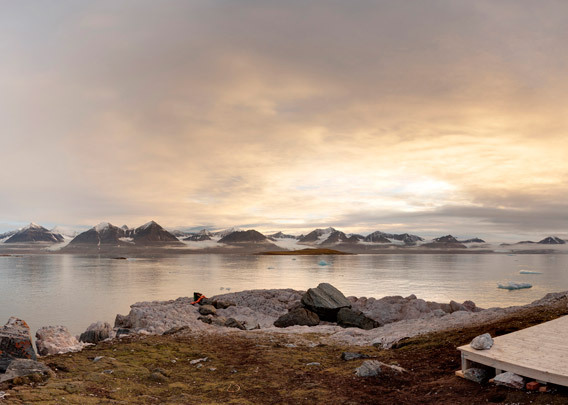 In contrast to many other places on Spitsbergen where the NEC was active, they did not build a hut on Juttaholmen. There are visible remains of an old camp site on top of the island, which may have served as accommodation with little comfort for the NEC workers. Lack of drinking water was only one of several problems. 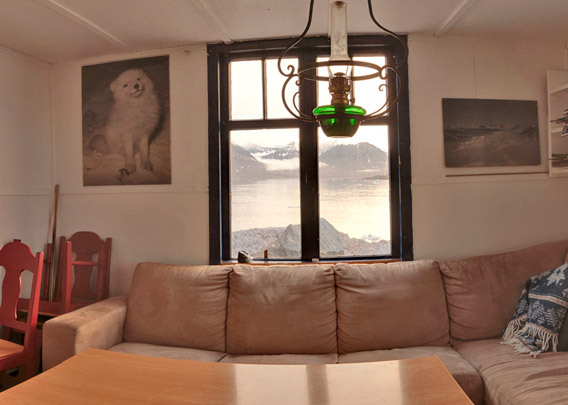 The hut that is standing on Juttaholmen was built in 1954-55 by people from Ny Ålesund, so it is younger than the activities of the Northern Exploration Company. It was mainly built for free time purposes. Now the scientists from Ny-Ålesund are the only people who use this hut on a more or less regular basis.